Mark Morris was born and raised in Russell County, Kansas. After graduating from Fort Hays State University and Wichita State University, he returned to the area he grew up, where he currently resides with his wife and three children. 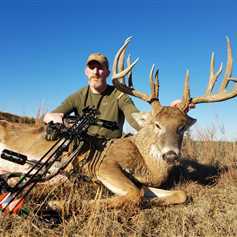 Pursuing trophy whitetails has become a year round effort for Mark. Whether it's supplemental feeding and food plots in the spring, trail cam inventory in the summer or early season scouting in September, he is always planning when and how to harvest his next whitetail. Through many years hunting his family farms, Mark has developed the ability to evaluate and maximize the potential of each piece of property to grow and hold whitetails, turkey or upland birds. He's excited to be a part of the Mossy Oak Properties team and looks forward to assisting you with buying or selling your next property.